Phillip: The beautiful thing about writing music reviews is discovering an artist that you never heard of before. Recently, I have received some of the best albums I have listened to this year by the likes of Lil’ Cap’n Travis, Matt Pond PA, Pfeifer Sam, The Roots and now I can add the thoughtful, alternative power pop of Bill Janovitz and Crown Victoria. But who is Bill Janovitz and what is his artistic vision? His artist biography states he was the front man of Buffalo Tom, a band where he “helped create a remarkable body of work.” Well I have heard of Buffalo wings and Buffalo Bill Cody but at the risk of sounding like a dilettante, if Tom were a singing Bison, this information would have escaped me. Luke: As a member and lead songwriter of seminal ‘90s rockers Buffalo Tom, Bill Janovitz combined the vivid introspection of a singer/songwriter with the visceral immediacy of a garage rocker, resulting in some of the most powerfully emotive rock songs in recent memory. Buffalo Tom’s brief encounter with commercial popularity peaked during grunge’s initial heyday, but while their songs were undeniably striking and forceful, they did so without the focused, laborious angst that trademarked the early Nirvana and Pearl Jam records. Aside from a handful of minor alternative radio hits (including “Sodajerk” and “Taillights Fade,” a song that I have to admit is the saddest, most genuinely desperate piece of pop music I’ve ever heard) they never approached the runaway success of their furious rock brethren, but did cultivate a core group of loyal fans both in their home base of Boston and other locales. Janovitz and his Buffalo Tom bandmates Tom Maginnis and Chris Colbourn put the band on hiatus following the chilly reception to 1998’s Smitten, affording Janovitz the opportunity to scratch his folk itch, which resulted in two sparse solo records, Lonesome Billy and Up Here. With rumors of a Buffalo Tom revival gestating, Janovitz has returned to his bread and butter, the punchy, affecting rock and roll that marked the heyday of that band. On Fireworks on TV!, a one-off recorded with his crack band of friends and cohorts, Janovitz rediscovers his inner rocker while combining it with a handful of the folksier sensibilities from his solo work. It’s not Buffalo Tom, but it’s a compelling rock and roll experience all on its own. Luke:Fireworks on TV! (replete with shamelessly appropriate exclamation point that just makes you think Super Bass-O-Matic 76!) was recorded in three days at the now-defunct Fort Apache Studio in Cambridge, Massachusetts, where Buffalo Tom recorded three of their albums from 1989 to 1992. 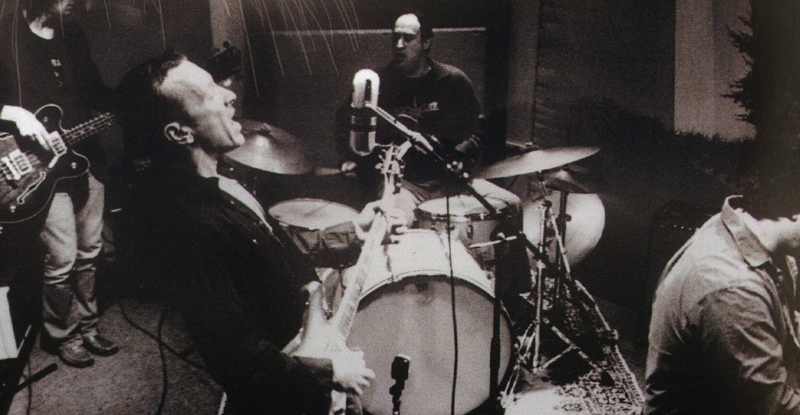 When one hears Janovitz’s vocals faintly ringing off of the studio walls, one can feel the urgency that drives the record forward, as if the band had only a few minutes to smash out one final take before the studio was bulldozed to make space for a mini-mall. He and his backing group, Crown Victoria – comprised of drummer Tom Polce, who also co-produced the record, bassist Josh Lattanzi, who has also played with Juliana Hatfield, Ben Kweller, and Howie Day, and frequent Buffalo Tom conributor Phil Aiken on keys, who just put out a solo record of his own – did the record live with minimal overdubs, so the on-the-spot energy imbues even the quietest passages. It’s a throwback record in the truest sense of the term, with live band performance and verve taking clear priority over manipulation and production values. Makes one long for the days when ProTools didn’t mean anything. “One, Two, Three” and “My Radio” blow the gates wide open right from the get-go, the former a midtempo potboiler with Janovitz’s acoustic and electric forming a potent combo, and the latter a snappy, efficacious romp that would have been a prime radio-ready rocker in a pop music universe with any semblance of justice. We’re also treated to two versions of the title track, a deliberate, introspective original and a smoking, no-frills second take that closes the album. Pensive numbers like “Mary Kay”, “I Found Out” and “Whisper To Yourself” are all marked by even the most minor of guitar squalls, though their measured tempos frame the album’s thick slate of rockers, of which “Almost Beating” and “Sinking” are a couple of the most striking. Phillip: “One, Two, Three” is indeed a very solid opener that has a vibe reminiscent of Graham Parker’s “Discovering Japan” with a touch of the Wallflower’s “Three Marlenas” thrown in. The upbeat energy of the record maintains nicely with “My Radio,” which carries on in the tradition of Parker, Elvis Costello and John Hiatt and features particularly good organ parts played by Phil Aiken (another regular member of the aforementioned band named after the hoofed creature). The reason I mentioned those other extraordinarily proficient singer/songwriters in the previous paragraph was to foretell the way I feel about “Almost Beating,” a song that is so dang blasted good that it is nearly a perfect power pop track. What do I mean by nearly perfect? Well, the melody is appealing, the energy level of the track sounds live, there are well defined musical parts and the lyrics tell a story without being too arty or pretentious; and did I mention that Bill really sounds like Graham Parker? Sometimes I have to listen to a song a few times before I get it. However, that certainly was not the case with “Minutes of the Day;” a song that immediately caught my jaded old ears. It is clear that Mister Janowitz understands how to fashion a good song, which by my definition includes writing a strong verse, chorus and bridge part, as well as putting equal effort into crafting well thought out lyrics. A perfect musical example of this is “Believe,” a song that is an ideal combination of chords, riffs, cool poetry and melodic sensibility. Phillip: This masterful record ends with the title track, yet another tuneful rocker that is driven by crunching guitars and the sturdy rhythm of pounding tom toms. It is so vibrant with energy, that I can almost picture the musicians bouncing along with the track while I am playing it. But don’t take my word for it. I strongly urge you to get this record and find out for yourself why I am excited about Bill Janovitz and Crown Victoria. Their brand fireworks will not leave you feeling burned. Luke:Fireworks on TV! is an unusual beast in an era where all music has been galvanized, forced to exist under the burden of a necessary genre or binding demographics. It’s the sort of album that those loyal to Buffalo Tom in their original incarnation, a fan base that is for the most part safely into their 30’s by now, can rock out to without pretense or compromise. Most of them have probably gotten their fill of Damien Rice, Norah Jones and REM by listening loyally to their local Triple A station, so they could use a good rocking. Janovitz is a consummate songwriter who is able to capture the true emotive power of rock and roll while keeping it accessible to an appreciative, blue-collar audience. You need no rock and roll pedigree to enjoy the bounty of Fireworks on TV! It’s all there for you. Just throw on the headphones and go. Not to mention it’ll keep the Buffalo Tom acolytes happy until their next record comes around.